An exiled Thai minister has formed a group to lead a campaign against the military government, which seized power in last month's coup. Charupong Reuangsuwan is the only minister to have escaped into exile. He called the coup, which followed months of anti-government protests, "an outrageous act" and "grand larceny". The Organisation of Free Thais for Human Rights and Democracy (Seri Thai) aims to "restore and strengthen" Thai democracy. In a statement addressed to Thai citizens and e-mailed to journalists, he said: "It is now tragically evident that Thailand has returned, once again, to a vicious cycle of absolute dictatorial governance." He accused the junta of stealing the people's sovereignty by seizing power from the elected civilian government, which was run by Mr Charupong's Puea Thai party. The military leadership has pledged to return to democracy, but only after it has carried out sweeping reforms of the political system. Mr Charupong, however, accused the military of intending to create "a new puppet structure" for "anti-democratic elements". His group has set up a YouTube channel and posted videos of the statement read out in Thai by Mr Charupong, and read out in English by activist Jakrapob Penkair. It is not yet clear from which country the new organisation will operate. In response, Acting Thai Foreign Minister Sihasak Phuangketkeow told journalists there was "only one legitimate government". The military seized power on 22 May, after six months of anti-government protests that left at least 28 dead and hundreds hurt. It said its aim was to restore stability to Thailand. The protesters alleged that the ousted government of Yingluck Shinawatra was controlled by her brother, Thaksin Shinawatra. He was Thai prime minister until his removal by the military in 2006. The current political turmoil dates from then. There is strong support for the Shinawatra family in rural and northern areas, propelling them to successive election wins. However, many in the middle class and urban elite oppose them bitterly, alleging they have corrupted Thai democracy with money politics. After the last coup in 2006 some supporters of the deposed Prime Minister Thaksin Shinawatra felt he should have established a government-in-exile, to challenge the legitimacy of the coup leaders. This time, they just do not have enough people. General Prayuth had many important political leaders locked inside an army building when he launched his putsch, and quickly sealed the borders. So the Seri Thai organisation - a self-conscious echo of the group that fought against Japanese occupation during World War Two - was launched today, the 82nd anniversary of the end of absolute monarchy in Thailand, by Charupong Ruangsuwan, the only minister from the ousted government to escape into exile. He is supported by Jakrapob Penkair, an outspoken red-shirt activist and former minister who fled from lese majeste charges in 2009. Both men are thought to be in neighbouring Cambodia, but are not stating where the Seri Thai movement will be based. 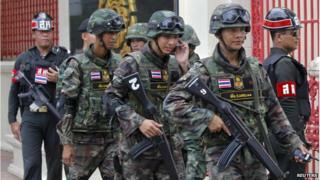 The Cambodian government is nervous about hosting opponents of military rule in Thailand. The sudden exodus of more than 200,000 Cambodian workers earlier this month is seen by some as a warning of Thai military displeasure with its neighbour. Seri Thai's effectiveness will depend largely on whether opposition to the coup grows inside Thailand. So far the military has snuffed out even the smallest expressions of dissent, threatening long prison sentences for those who remain defiant. Seri Thai will also need funding - that raises the question over what, it any role Thaksin Shinawatra will play. He was accused of directing and funding the last administration, but has said little since the coup. Meanwhile, the European Union's foreign affairs council on Monday said it would suspend official visits to and from Thailand. It said EU states would not sign a partnership and co-operation agreement with Thailand until a democratically-elected government was in place. Military co-operation with Thailand will also be reviewed. "Only an early and credible roadmap for a return to constitutional rule and the holding of credible and inclusive elections will allow for the EU's continued support," said the council, adding that the military's current plan for reform "falls short". It also urged the military to restore democratic institutions and processes, free political detainees, refrain from further arrests for political reasons, and remove censorship.